Gradually, as I learned more and more about my innate love for gin, my appreciation for St. George deepened even more. Theirs are stellar. In fact, a great holiday gift idea for your favorite gin lover is their holiday gin 3-pack, which includes their Terroir (their locavore variety), Botanivore (herbaceous, 19 different botanicals) and Dry Rye gins (juniper forward). You can get them at Bar Keeper or K&L for $26. I absolutely love their Terroir. St. George produces Hangar One Vodka, which is distilled not only from potatoes but Viognier grapes and way more interesting. 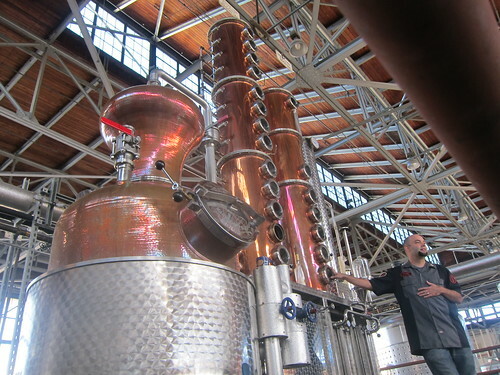 If you’re ever in the Oakland or Northern California area, my advice is to visit St. George Spirits in Alameda and take the free tour. You’ll learn a whole lot – and their facility in itself is awe-inspiring. As is their craft-informed attitude, which you can get a good feel for thanks to everyone who works there (30 employees in all). St. George Spirits, which makes Hangar One Vodka, is actually housed in Hangar Twenty-One. But who can blame a distillery for smart branding? The distillery has existed at this location since 2004. The Willy Wonka-esque stills were hand- and custom-made in Holstein, Germany – no other distillery has these stills. Hanging out in the distillery is an animatronic shark mold from the hilariously-bad-it’s-good movie, Deep Blue Sea. Just for kicks. And after drinks. It took thirty-two tries for their Absinthe Verte label to get approved by the U.S. Alcohol and Tobacco Tax and Trade Bureau. One of the main points of contention was that the original label had a monkey banging a bone on a skull. The skull “made too much reference to its hallucinogenic properties of absinthe” according to the TTB. St. George was going to refute this with many examples of skulls in spirits today (e.g. Crystal Head Vodka, for one), but TTB would’ve used that against those other distillers. Instead, St. George decided to stop the fight there and replace it with a Christopher-Walken-on-SNL-inspired cowbell. There was a break-in attempt at the distillery last year – by one 18-year-old and two pants-wetting 15-year-olds. Good thing the distillery not only has motion detection but sound detection. The ceiling is made entire of Redwood and the floor is 17 inches of concrete. As a former naval base hangar, there’s a hatch with a tunnel…that’s ultimately been clogged up with a brick wall. Boo. Our tour guide, Pauly, also did a great job at educating an audience that cared about tasting spirits over getting “tanked” and even addressing the bad habits that often accompany peoples’ drinking (sugar). His practical preventive hangover cure? To prepare, by your bedside, a pint of water, two pieces of bread, a non-caffeinated multi-vitamin and a bottle of Pedialyte. Consume all after getting home safely and before hitting the hay. Never have wiser words been spoken – and this was on a free tour! Another refresher course lesson learned in advanced drinking on the tour was to not treat high proof spirits like you would wine. Stop swirling your high proof alcohol. You are warming it up, making the vapors expand on your taste buds so that it tastes hot. Brandy snifters are meant to heat the alcohol enough through the heat of your palm. 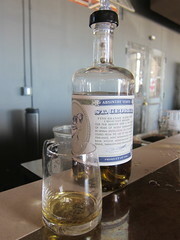 And so it continues, St. George educating the rest of America about high-quality, craft spirits. Happy 30th Birthday, St. George Spirits. Thank you for a great 30 years “under the influence;” we’re all looking forward to many, many more. Tours: Last call is 1 hr before closing time. Groups of 5+ should make a reservation by calling. Calling ahead for smaller parties also encouraged. This entry was posted in cocktails, NorCal and tagged 30th Anniversary, @stgeorgespirits, absinthe, Alameda, California, distillery, gin, Hangar 21, Hangar One, naval base, NorCal, St. George, St. George Spirits, stills, tour, vodka. Bookmark the permalink.